Pond is creative portfolio / agency WordPress theme designed to attract audiences in no time. Its single page / multipage premium WordPress theme built with viewport border to highlight the content and supports parallax background images / videos as well. Bundled with slider revolution ($18) premium WordPress plugin and theme supports bottom overlay and top overlay headers. Pond portfolio / agency WordPress theme supports elegant layered navigation which helps the users navigate the site faster than ever. Included with pixeden icon fonts, Font Awesome icons gives you scalable vector icons with the power of CSS. Supports full width and boxed style gallery layouts with lightbox option and included with various shortcode elements to add some spice for your website. 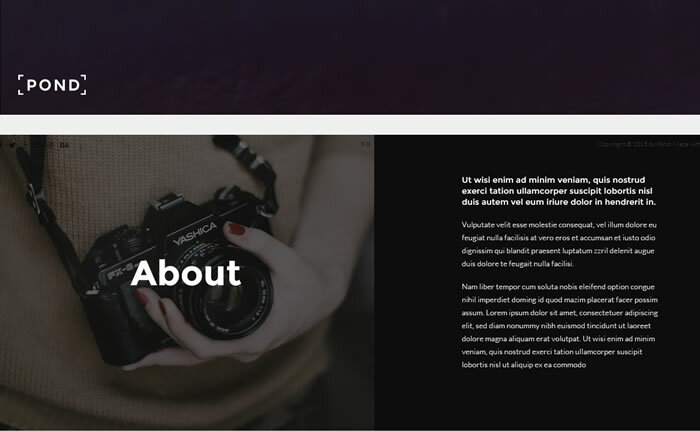 Pond is 4.1+ ready WordPress theme enabled with split sections, will automatically adapt to the width of the browser which you can divide into 2 parts, under this you can add any type of content or just a background image/video.